Sinningia schiffneri has two forms in cultivation. 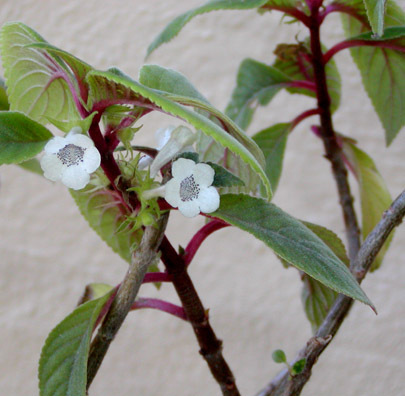 One has plain green leaves and stems, and the other (shown in the picture) has red petioles and red veins on the leaf backs. The latter form is more attractive. Attractive vegetative growth is important because S. schiffneri doesn't produce a lot of flowers, and the ones it does produce are relatively small. The plant does not branch readily. Almost all the branching is at or near the base. This is in contrast to its relative, Sinningia gerdtiana, which branches at every opportunity. These two species are the only sinningias which never form tubers. Their next closest relative is the bizarre Paliavana plumerioides. Giving this species plenty of water will both prolong the blooming season and produce a greater abundance of flowers. This plant was grown by Jon Dixon. Note the grooves in the base of the flower. They are also apparent in the S. schiffneri hybrid S. 'Carnaval'. This species has a relatively large fruit for a sinningia. 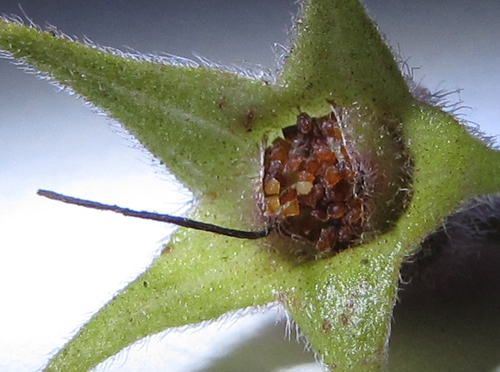 The seeds are large and chunky, about 0.5 mm in diameter (that's large for a sinningia). This photo was taken using an LED flashlight for illumination. Leaves Green. One form has red hairs. Inflorescence Axillary cyme, usually one flower. My largest plant has occasionally had two flowers per axil. Flower White, funnelform, spotted purple. 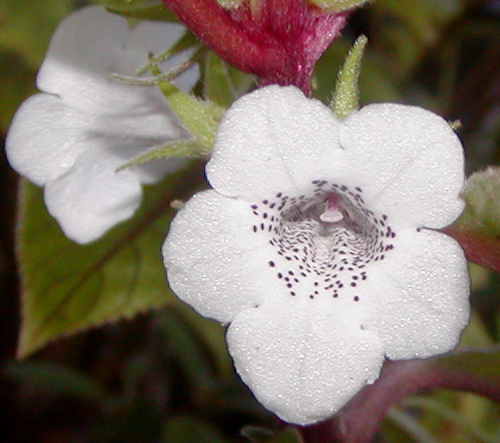 See a comparison with other sinningia flowers. Hardiness Has survived 30 F (-1 C) in my yard, but lost all its leaves. One plant died at 28 F (-2 C) but a large one survived 27 F with major damage. Propagation Cuttings root and grow readily, unlike many of the species that have tubers. Recommended? Yes, if you can obtain the red-leaved form. Hybrids with this species See listing. Taxonomic group The thamnoligeria clade. S. schiffneri was first described by Fritsch in 1908. Its first known commercial listing was in the 1964-65 Kartuz catalog.